When picturing Palm Springs, palm trees, bright colors and 1960’s modern architecture usually comes to mind. Palm Springs has been known as a glamorous, desert getaway for many years. Lucky for us, this shady oasis has managed to keep its laid back and partying reputation with Angelenos constantly retreating to this desert for its party and festival scene. Read on for your weekend getaway guide to Palm Springs! The Saguaro – This iconic, rainbow-painted hotel is a must-see while you’re visiting Palm Springs. Whether you’re here to experience the wonderful accommodation or enjoying the pool at The Splash House, this is one of the ‘it’ places of Palm Springs. And definitely one for the insta. Korakia Penisone – Instead of escaping into 1960’s Cali-vibes, why not retreat to a hidden, Moroccan oasis? This hotel is a cross between Mediterranean architecture with Moroccan decor, giving you the feeling that you’ve escaped to Casablanca instead of Southern California. Parker Palm Springs – Famous for weddings, parties and features on television, the Parker is where you want to go when you’re looking for a old Hollywood retreat. The Amado – The Amado is the boutique, mod experience you’ve wanted from Palm Springs and more. With only 5 units, this cozy home has been renovated into the perfect group getaway or bnb experience, with all of the succulents you could dream of. Avalon Hotel and Bungalows – One of the most lavish and luxurious hotels in Palm Springs is the Avalon Hotel, known for their spectacular spa, pristine pool views and all-white bungalows. The Avalon is also a major destination and event retreat for Hollywood celebs, so make sure to keep an eye out at the pool! Cheeky’s – You know beer and wine flights, but ever heard of a bacon flight? Try different types of bacon, creative french toasts and bomb bloody mary’s at this famous breakfast joint in the middle of Palm Springs. Birba – In the heart of the Palm Springs dining center lies Birba, known more for its strong cocktails than its shareable bites. Come here if you’re looking for a low-key nightlife that makes you truly feel like you’re vacationing in the lavish Palm Springs. Miro’s Restaurant – For old world romance in new world setting, Miro’s is the best place for quality food and a moody ambiance. Enjoy European dishes outside amongst the mountains and quaint brick wall or inside with low-lit elegance and intimacy. L’Atelier Cafe – This French favorites is a perfect lunch spot if you want to getaway from the never-ending desert heat. From croque madames to stuffed croissants to fluffy quiches, this cafe does not skimp on the egg! Felipe’s – Even far out east, you can bet you’ll find quality, SoCal Mexican food and no restaurant tops Mexican cuisine quite like Felipe’s. Sure it’s a tad far off compared to other restaurants in the area, but you won’t regret the drive after trying their fish tacos or chile relleno. 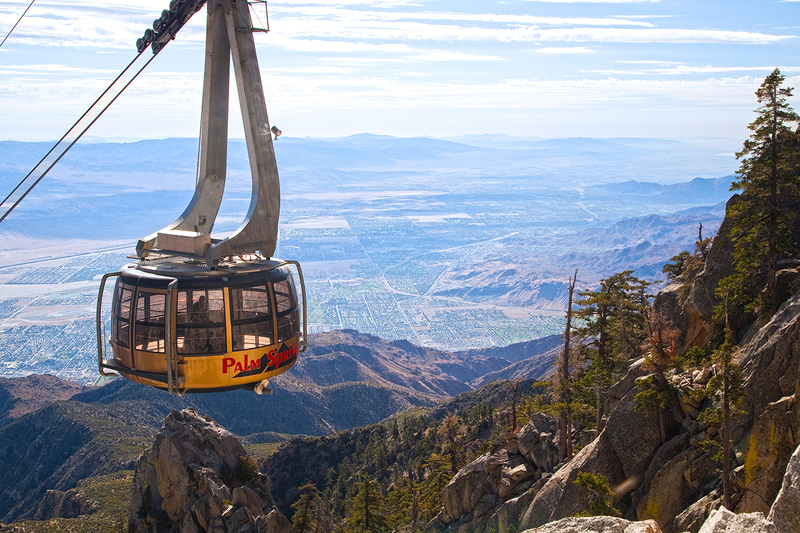 Ride the Aerial Tramway – Perfect for families and a bit more of Palm Springs culture, the aerial tramway is the highest rotating tramway in the world taking you 8,516 ft above sea level. Enjoy the ten minute ride with spectacular views and have lunch at one of their two restaurants before taking a hike through the mountains. Enjoy the Casinos – There are quite a few places to get your gambling kicks in Palm Springs. The closest casino is Spa Resort Casino, however the award-winning casino is the Fantasy Springs Resort Casino in Indio. You could also drive to Rancho Mirage or Coachella to visit their various casinos. Relax at the Pool – One of the best parts of visiting Palm Springs is being able to kick back and relax. Enjoy the desert sun and bask poolside in your cute bikini. Party at Coachella or Stagecoach – Not far from Palm Springs lies two of the biggest musical festivals in the country: Coachella for two weekends and Stagecoach to follow. Odds are you have heard of this boho or country weekend getaway filled with food, music, activities and celebs, so I won’t tell you how badly you need to add one of these to your bucket list. Fly from the Sky – One of the coolest activities you can try in Palm Springs is skydiving where you can witness deserts and mountain ranges from the very, very top! Enjoy the ultimate thrill before you wind down the afternoon with a cocktail. Palm Springs Art Museum – Originally created in 1938 to showcase Native American Art, Palm Springs houses some of California and the nation’s greatest masterpieces. This museum still pays homage to its cultural history, but make sure to visit one of its many contemporary art collections. San Jacinto Mountain – Whether you hike up this beauty or view from afar, San Jacinto Mountain is worth a spectacle. The famous San Jacinto Mountain range, home to the Idyllwild campgrounds, turns your typical Palm Springs getaway into an ideal hiking destination. Visit the Living Desert Zoo and Gardens – 30 minutes outside of Palm Springs lies the Living Desert Zoo and Gardens, where you visit animals from around the world at this desert oasis. This non-profit zoo is one of six private zoos in the US and is dedicated solely to deserts of the world. Palm Springs has been a favorite destination for us Angelenos for a long time! Head to this 2-hour escape from the big city to see what all of the buzz is about and enjoy your weekend getaway to Palm Springs.